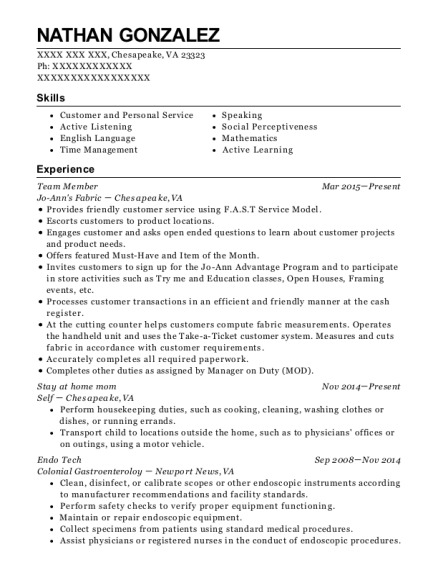 An energetic team leader, able to communicate effectively with people of all ages and backgrounds, to work collaboratively to resolve problems, and to motivate team members to achieve personal and organizational objectives. Qualified Divisional leader of eighty eight recruits. Distributed watch schedules and/or work orders for the Division. Gathered and organized information on procedures of the day. Applied education of conflict resolution and recourse action. Answered telephones and gave information to callers, took messages, or transferred calls to appropriate individuals. Created, maintained, and entered information into databases. Worked closely and followed orders from the chain of command. Excelled in physical training and exceeded physical qualification standards. Certified in Naval small arms instruction. Was selected in assisting of hand-to-hand combat training by the instructor out of a group of eighty eight fellow recruits. Autonomously operated a baler, daily baling poundage roughly between 18,000-20,000 lbs of animal bedding for commercial use and private ranching. Monitored machine operations and observed lights and gauges in order to detect malfunctions. Reviewed work orders, specifications, and instructions to determine materials, procedures, components, settings, and adjustments for forming, pressing, and compacting machines. Recorded and maintained production data such as quantities, types, and dimensions of materials produced. Inspected and measured work pieces to mark for cuts and to verify the accuracy of cuts, using rulers, squares, or caliper rules. Examined lumber to plan the best cuts. Set up, operated, or tended saws or machines that cut or trimmed wood to specified dimensions, such as circular saws, band saws, multiple-blade sawing machines, ripsaws. Responsible for inspecting stock for imperfections or to estimate grades or qualities of stock or work pieces. Cleared machines for jams, using hand tools. 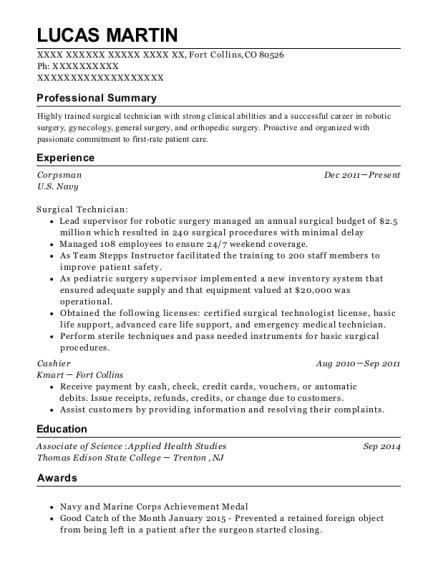 This is a resume for a Naval Corpsman Recruit in El Paso, Texas with experience working for such companies as United States Navy and Tewa LLC. 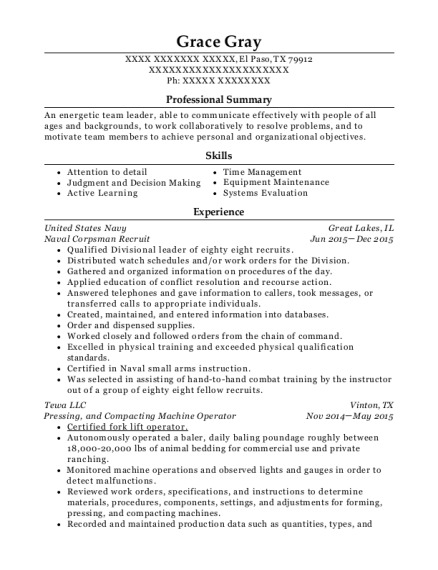 The grade for this resume is 0 and is one of hundreds of Naval Corpsman Recruit resumes available on our site for free. 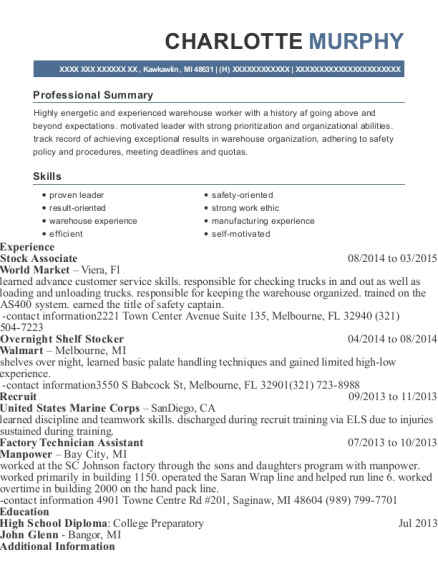 Use these resumes as templates to get help creating the best Naval Corpsman Recruit resume.